Heartache Looking for a Home reached #1 on Cashbox Magazine's Top 20 Bluegrass Albums last summer, was chosen in Bluegrass Today's Top 10 Albums of 2011, and spent numerous months on SiriusXM Radio's Bluegrass Junction's Most Played Albums chart. "No Lawyers In Heaven," spent two consecutive months at #1 on Bluegrass Unlimited Magazine's Top 30 Songs chart (Oct-Nov '11), #1 on Bluegrass Music Profiles Magazine's Top 30 Hot Singles chart (Jul '11), and reached #1 on Power Source Magazine's Top 35 Albums chart (Oct '11). 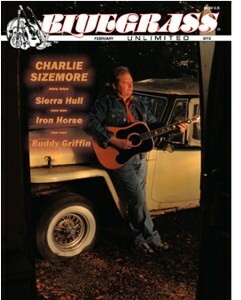 CMT.com says Sizemore "possesses one of the finest, most unaffected bluegrass voices I've come across," and his fans certainly agree. There are numerous favorites on this hot album including the popular "Red Wicked Wine" with special guest, Ralph Stanley that certainly brings back memories of Sizemore's days with the Clinch Mountain Boys. Other fan choices include "Ashley Judd" along with title track, "Heartache Looking for a Home" that has spent numerous months on SiriusXM Radio's Bluegrass Junction Most Played Tracks. The Charlie Sizemore Band is now on tour and includes the talents of: Charlie Sizemore (lead vocals, guitar); Danny Barnes (mandolin, vocals); Charles Fields (bass); Josh McMurray (banjo, vocals); and Paul Kramer (fiddle and vocals). For more information on the Charlie Sizemore Band, please visit their website or check out NPR's Mountain Stage to hear the band's recent performance.